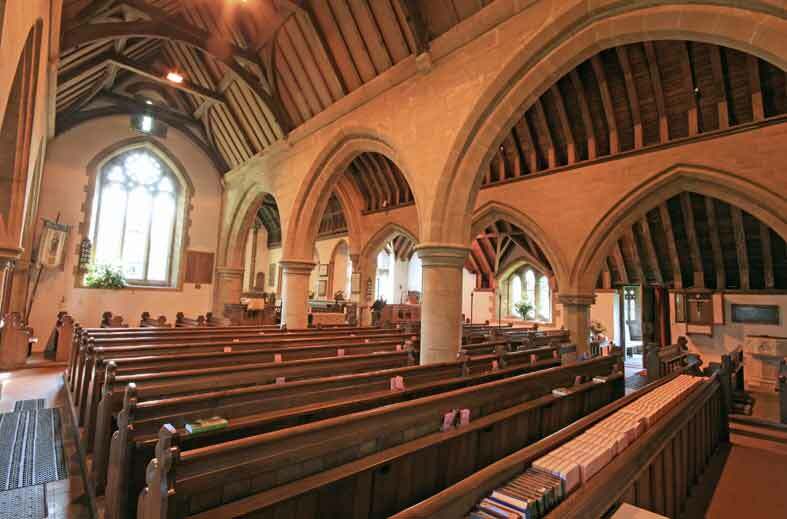 This is the aisle, including the pews, that runs to the right from the ancient entrance door towards the organ, and is believed to have been added in about 1350. There was originally a first floor gallery above this aisle that extended above the pews in the Nave. When the gallery was removed some of the rafters were re-used above the entrance door and the current font area. The gallery (which was used by the servants of the Hooke and Ades estates) can be seen in the photograph on the right and was accessed through a door in the southern wall that is still present behind the current organ console. It would seem likely that the gallery, staircase and south aisle would have been quite dark before the gallery was removed with light being provided by the east-facing lower window (next to the door), the smaller one above it and the two windows in the roof that are shown in the drawing of the church in about 1780. The two windows in the roof were subsequently removed, and a picture of the church from about 1845 shows only one remaining. The restorations undertaken in 1878 included replacement of the exterior tiles on both the north and south roofs with Horsham stone, although the original pitch of the roof was retained. The font was also moved from beneath the gallery to its current position, which until this time was the vestry. At the eastern end of the aisle the sides of the arch above the organ are considerably taller than sides of the other two arches to its right. This is because the original organ, pipes and console were all housed beneath this arch, but when the organ was rebuilt and enlarged in 1955 the pipes and works were moved to the tower and only the console remains in the south aisle. 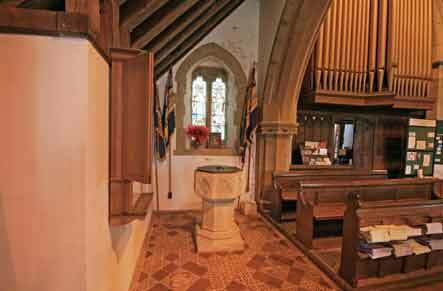 The memorial to parishioners who died during the First World War that’s found on the left as you enter the church (near the font) is made of teak from HMS Britannia and was unveiled on 4 June 1918 as a temporary tribute. A further eleven men from the village died before the end of the war.